Once I get started working with Bernat Blanket Yarn, I can’t stop! It’s so addictive! Everything I make with this yarn works up so quickly because of it’s chunky and super soft texture. Seems like everyone these days is obsessed with crochet Jellyfish and I thought I would go ahead and jump on the jellyfish bandwagon with this Giant Jellyfish! This guy worked up in only a few hours! It’s approximately 23 inches long (counting the coils) and 9 inches wide. 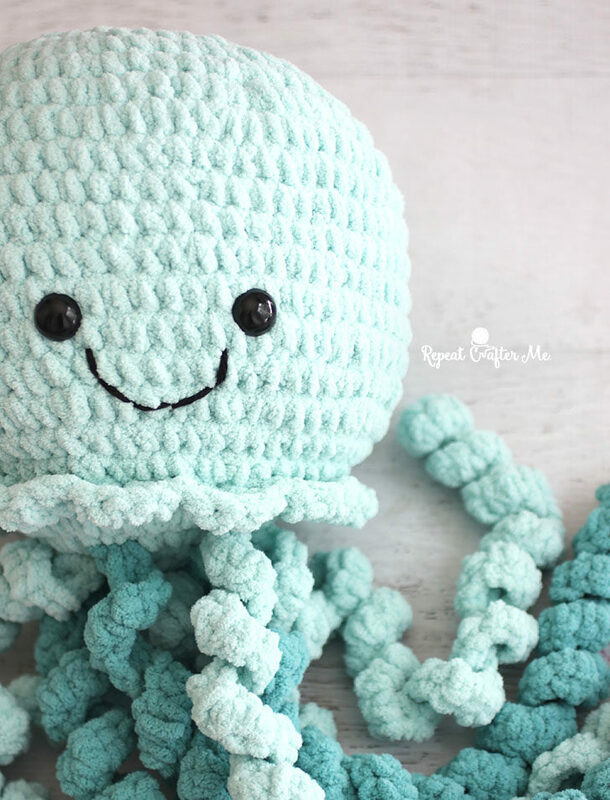 I used color Seafoam green from the Bernat Baby Blanket line which seems so appropriate for this sea creature! You can shop the yarn HERE at Yarnspirations.com. You will only need one skein! 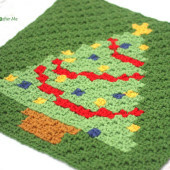 – (optional) Bernat Blanket Yarn in a coordinating color for multi-colored coils. I used Teal. You will only need a 100g skein. – (2) 18mm black safety eyes. I found mine at JOANNs but you can also purchase HERE on Amazon (aff). – Small strand of worsted weight black yarn or embroidery thread for mouth. Round 21: in front loops only, skip a stitch, 4 DC in next stitch, skip a stitch, join to next with a slip stitch, skip a stitch, 4 DC in next, skip a stitch, join to next with a slip stitch, repeat around and join. This makes the scallops. Fasten off and weave in ends. Add 18mm safety eyes about 6 stitches apart from each other and about 5-6 rows up from the bottom. Stitch on a smile between eyes with black yarn. Stuff jellyfish generously with Poly-fil fiber stuffing. Fasten off leaving extra long tail. Chain 60, 2 SC in second chain from hook and the rest of the way down. Fasten off. Leave loose ends to tie onto underside of jellyfish. Make as many coils as you want! I made 5 in Seafoam green and 4 in Teal. Attach coils to bottom piece. Tie tightly and don’t worry too much about weaving ends because they will be on the inside of the jellyfish. Attach bottom of jellyfish (make sure coils are attach first) to the jellyfish body. Using your tapestry needle and the whip stitch, sew edges of the bottom piece to the back loops of the last round of the jellyfish body. 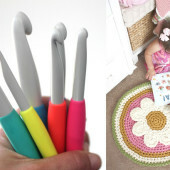 Super cute, super soft, super big, super easy and quick to crochet! This is a great gift for all ages!! 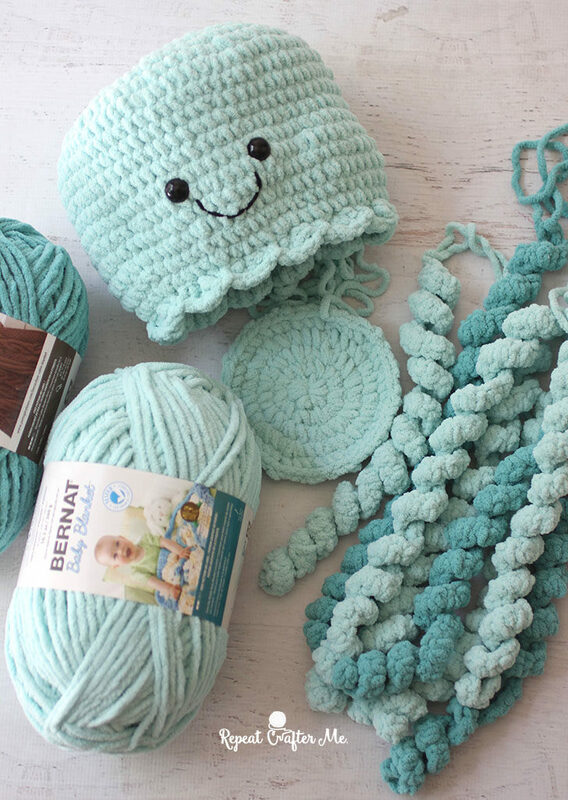 If you make this giant jellyfish please be sure to use hashtags #RepeatCrafterMe and #BernatBlanketYarn on social media! oh wow! I love it so much!!! The yarn looks fab and Iove the colour too! Will there be a video tutorial? I love this! Oh great. The product is made of wool very soft and beautiful. I used some stash pink Bernat blanket to make one before I saw your pattern, and it is adorable, but your pattern will be used on the next ones! 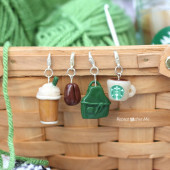 Thank you for making these projects so easy with your simple, clear instructions! I love your jellyfish. That is too cute. Oh my goodness, it’s so squishy and awesome! My tentacles are not curling. Any suggestions? The body is soooo cute. Thanks for the help in advance. I love this pattern. Thank you. Made 2 for my kids and they sleep with them every night. I started crocheting about a year ago. Your blog was probably the first I came upon and holy cow, no one compares to you. Your instructions are so clear and accurate. It hurts when I go to other blogs and am like “What is this person talking about? What do they want me to do?” I may be new but you make me feel like a pro. Just love your patterns. 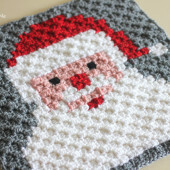 I was wondering though, i would love to make one of these for my new baby niece, but i think it would be too big. How would i make it smaller? Would I just use a thinner yarn and appropriate hook? What price point would you suggest for selling this wonderful large jellyfish? So when you say to decrease then sc in next 5 are you supposed to skip one or skip five? A decrease isn’t skipping any stitches, it is crocheting 2 of the stitches together. You would start a sc by slipping your hook through the top of the previous row, yarn over and pull the yarn through as usual, but instead of yo and pulling through the 2 loops on the hook, you move to the top of the next stitch from the previous row. Put your hook through this stitch as well, yarn over and pull the yarn through, now you have 3 stitches on your hook, continue to sc as usual (yarn over and pull through all the stitches on the hook). This is a basic sc stitch decrease, there are move advanced invisible decrease techniques available. Both techniques have videos on Youtube if my text based instructions don’t make sense to you. So the instructions say decrease then sc in the next five means: sc decrease over the next 2 stitches, once the decrease is done, you do 5 normal sc in the next 5 stitches, at this point if it is a repeat, you would decrease again and then sc in the next 5, rinse and repeat. Its so much smaller than I expected! I followed the instructions exactly but it’s only 1/2 the size that the picture is in! Do you have any suggestions? I’m not sure if this would possibly make a difference, but I used an 8 mm hook instead of 5.5 mm, because I couldn’t manage a hook that small with the blanket yarn. I think I crochet too tightly to use a smaller hook. Mine looks about the same size as the picture. I haven’t stuffed it yet, but it appears that the stitches are still tight enough to hold the polyfil. Mine came out smaller than the picture too. The tentacles are about half the size, if that, compared to the picture. Any suggestions? So I’m struggling here! I have restarted this thing about 10 times and every time it’s looking like a potato chip because it’s not laying flat. Has anyone else had this problem?? What can I do to keep it from bowing? Yes I’m having the same problem! And I don’t know if I crochet too tightly or missed a loop or something. Maybe I will try with a bigger hook (like 8mm). When crocheting the head, my circle does not lay flat … is that normal or am I doing something wrong?? Omg how precious! I love it!